The DMX-E-4203 was designed from the ground up to be more price-feature-value competitive than any other printer in its class. 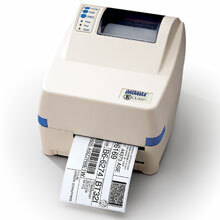 It can print a wide variety of labels ranging from small office shipping labels to compliance and general purpose product identification labels and tags. Medical laboratories automobile service shops shipping-mail centers and inventory stock rooms are all typical examples of the types of businesses that can benefit from the E-4203. And with PDF417 and MaxiCode 2D barcode capabilities the E-4203 can print complex transportation symbols and label formats. The Datamax-O'Neil J12-00-09000U00 is also known as DMX-E4203DU	or J120009000U00	.